The last ‘A Look Back in Time’ column described the progress made, and success achieved, by the Cornish rugby team in the 1957/58 County Championship competition. Club-wise it was a season for the Pirates that opened with a Scottish Tour which proved a great success. Our captain was Jimmy Jenkin, who was unfortunate to miss most the season because of injury. Jimmy Hosking set a new club record by playing his 400th game in our colours, and he and Graham Paul received their first Cornish 'caps'. 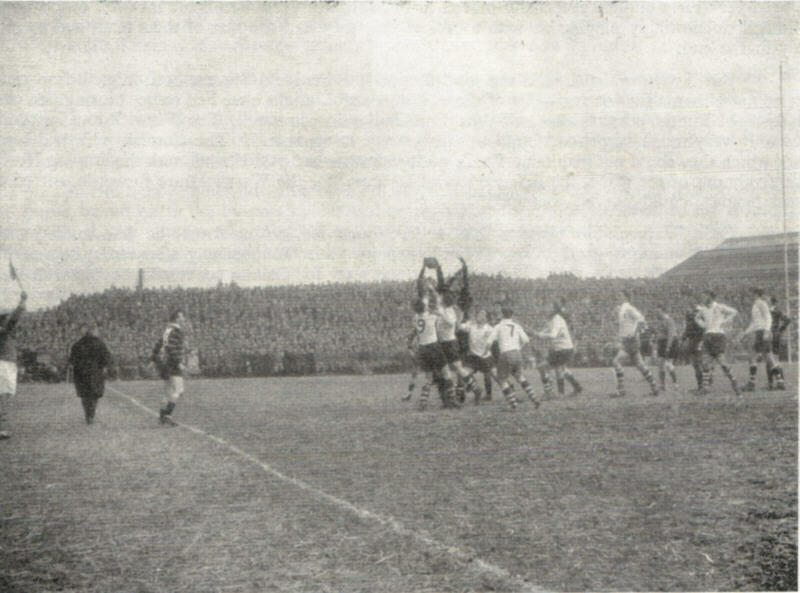 When the SW Counties played the Wallabies at Plymouth in January, the Pirates were represented in the shape of wing Mike Jenkin, centre Gerald Luke, and second-row forward Alvin Williams. At the end of the season we beat Redruth 21-6 in the final of the Cornwall Sevens competition. The side fielded was Peter Michell, Charlie May, Geoff Vingoe, Jimmy Jenkin, Jackie Bowden, Gerald Luke and Tony Stevenson. Now, back to county matters that season – as promised! In the semi-final played at Redruth in February, Cornwall had defeated a strong Lancashire side 14-8, which earned a place in the final played against Warwickshire at Coundon Road, Coventry, on the 8th March. Cornwall: H. Stevens (capt – Redruth), J. M. Jenkin (Pirates), G.G. Luke (Pirates), R. Hosen (Penryn), J. Morgan (Falmouth), G. Paul (Pirates), P.J.B. Michell (Pirates), J. Phillips (Redruth), D. Mills (Harlequins), V.G. Roberts (Penryn), A. Williams (Pirates), G. Harris (Camborne), C.R. Johns (Redruth), K. Abrahams (Redruth), A. Mitchell (Redruth). Cornwall’s team – for the Final! Warwickshire: D.F. Allison (capt – Coventry), D.R. Curry (Moseley), T. Carris (Loughborough College), W. J. Stewart (Coventry), P.B. Jackson (Coventry), C.A. Hewitt (Cardiff), G. Cole (Coventry), J.F. Gardiner (Coventry), S.J. Purdy (Rugby), R.F. Batstone (Coventry), T. Pargetter (Moseley), J. Price (Coventry), M.R. McLean (Coventry), F.J. Webb (Rugby), P. Judd (Coventry). Some 5,000 Cornish supporters invaded Coventry, many congregating to sing 'Trelawny' and 'Camborne Hill', and chant 'Oggy, Oggy, Oggy' outside of the The Hotel Leofric in the city’s main square, where the Cornwall side was accommodated. Also, at match time the supporters again made themselves heard, with horns and rattles creating an almost ear-shattering cacophony of sound. As for the match itself, Cornwall led 5-0 at half-time despite playing against the wind and occasional flurries of snow. Locks Gary Harris and Alvin Williams secured good line-out ball, a nimble-footed Graham Paul twinkled in attack, and skipper Harold Stevens was heroic in defence, him also converting the one try scored in the tenth minute by Vic Roberts. The second half, however, was to belong to Warwickshire,their strong pack laying the foundations to come back and win 16-8. At no time did Cornwall play badly, as every man gave his all, but against the might of their opponents it was not quite enough. Yes, it was defeat, but disgrace – never! Later that evening, as supporters gathered outside Coventry station to return home, there was natural disappointment, but still pride in their team's efforts. The strains of 'Trelawny' caught the ear once more! Cornwall Sages, among them certain members of the 1957/58 team, are holding their next meeting at the Pirates ‘Westholme’ clubhouse this Thursday 8th March – 60 years to the day of the final - commencing 2pm. The building at the RHS is the Carbodies factory which is also visible in your 'Oggy' shot.